iOS 5 comes with a bunch of accessibility improvements, like the AssistiveTouch feature that lets you use your device with adaptive accessories and even create your own gestures. 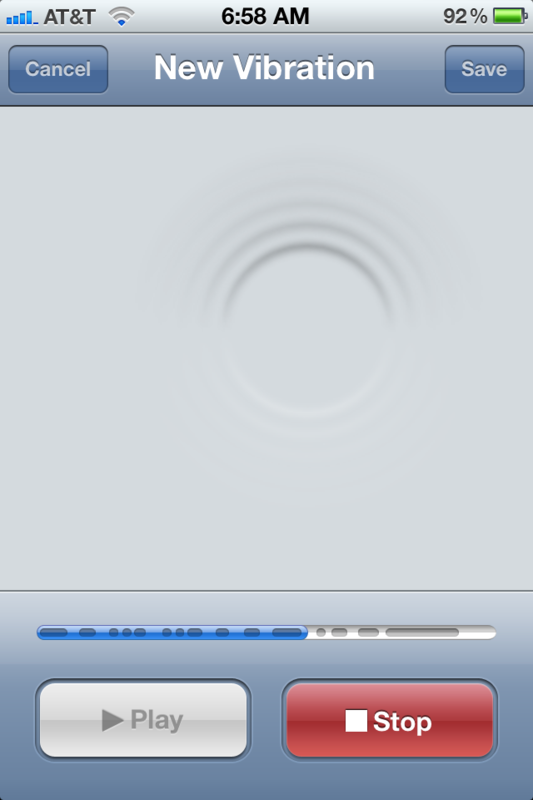 Another easily overlooked addition: Custom vibrations, on a per-contact basis, as pointed out by MacRumors. This is kinda cool, not just for the hearing impaired but for the rest of us as well. Example: If you’re in a meeting and your device is in silent mode, you can tell when your wife is calling based on a vibration pattern – how cool is that? This is a pretty cool trick that works in the Camera app on iOS 5: Simply swipe your finger from left to right to bring the camera album roll up. Continue swiping from left to right to flip through your images. If you go too far, tap once to reveal the on-screen toolbar with image controls and hit Done to immediately return to your camera. Pretty neat. Thanks, Jared! With iMessage, we’ve created a new messaging service for all iOS 5 users. You can send unlimited text messages via WiFi or 3G from your iPad, iPhone or iPod touch to anyone with one of those devices. iMessage is built into the Messages app so you can send text, photos, videos, locations and contacts. Leep everyone in the loop with group messaging. Track your messages with delivery receipts and optional read receipts, see when someone’s typing and enjoy secure encryption for text messages. Even start a conversation on one of your iOS devices and pick up where you left off on another. iMessage announced by Apple on Monday will challenge RIM’s highly popular BlackBerry Messenger (BBM) instant chat service which has given the Canadian company an edge over its rivals. The Apple announcement made investors more jittery, plunging RIM stock on both the Toronto Stock Exchange and Wall Street Tuesday. It slipped more than three percent in Toronto to close at $36.92, and 2.8 percent on Nasdaq to close at $37.82. Why are investors worried about iMessage affecting RIM’s chat service? As soon as he took the stage, Apple’s boss noticed someone dear to him in the audience. If you wanna learn more about iCloud but hate the idea of streaming the WWDC 2011 keynote via Apple’s site due to interruptions and varying image quality, you can now download the entire presentation to your computer and sync it to your favorite iOS device for offline viewing anwyhere, anytime (see the irony of that?). The keynote video is available as an iTunes podcast or as a direct download here. Weighing in at a cool 1.22 gigabyte, the MP4-encoded file in 640-by-360 pixel resolution is probably the highest-quality Apple keynote we’ve downloaded from iTunes to date. If you were wondering why all the fuss about Lion, iOS 5 and iCloud, grab the episode and enjoy in nearly two hours of the uninterrupted reality-distortion field. Apple’s chief walked on San Francisco’s Moscone West stage yesterday to a noisy applause. 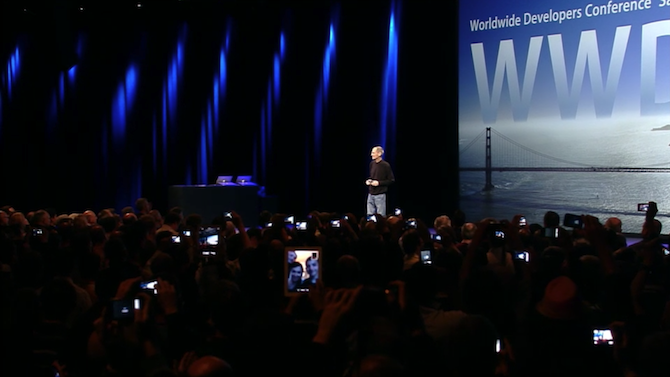 Check out journalists and developers in the audience snapping the charismatic CEO using their iPhones and iPads.